When Esther asked me to accompany her to her first opera, she first asked about La Traviata. I immediately said "no". I'm no fan of Traviata and I couldn't bring myself to see it again, even if it was a treat. 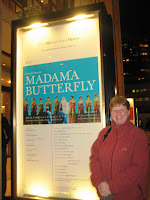 But, I looked at the Met's schedule and saw that Madama Butterfly was on and that Patricia Racette was singing. My heart beat just a bit faster at the possibility of hearing Pat sing live again. I suggested it to Esther, thinking that not only the opera itself but this particular production would be a good first opera for her. She bit. How disappointing to arrive and find a replacement notice slip in the Playbill! This was the first time this ever happened to me with this caliber of star for any production - opera or otherwise (well, not completely true - La Diva Renee was replaced by Opera Hunk Rene Pape last year at a gala concert - c'est la vie). Never mind, it's the Met. All of the singers are worthy and this is Butterfly - how can you go wrong? So was the case with Maria Gavrilova. Roberto Aronica as Pinkerton was also out and was replaced by the ubiquitous and reliable Marcello Giordani. I think I've now seen him and any other performer. He's no favorite of mine, but at least you know what you're getting. Gavrilova was wonderful as Butterfly. Okay, she didn't act her like Pat and she didn't float the notes for impossibly long minutes like Pat, but she was Butterfly. I had the seen the Met's previous production only once - my second opera - and now I've seen the current Minghella production five times, and honestly it just doesn't get old. The colors, costumes and imagery just make my heart beat faster and take my breath away. It was fun seeing an opera with a first timer. I had a feeling she'd like it. I don't know why anybody is ever surprised at how wonderful the Met is, but she was and I'm glad I was there to witness it. I am dumb. What production am I seeing at the Lyric in Chicago in January? It's staged by Hal Prince, is all I know. It's the same opera, just a different production/staging. It will be fab! are you coming for Peter Grimes? Yes! We are coming for "Peter Grimes" on 3/21/09. Pat's "Ellen Orford" is exquisite.